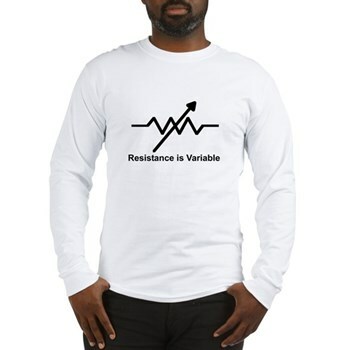 An awesome geek t-shirt from Omni Mega Global Media - "Resistance is Variable". Made of 6.1 oz 100% luxuriously soft ring spun cotton, this long sleeve tee is sure to please. The "Resistance is Variable" long sleeve tee features a variable resistance on the front and displays your geek cred, especially if you can tell people how it works. I know how... do you? Available in White or Grey - choose the color you like best. Prices start at $21.99 - available only the the Omni Mega Global Media CafePress store. Buy one today!